Since I’ve been doing the blog from the iPad the last few times, I need to take more pictures with this contraption! It’s a little awkward doing so, but I’m trying…really I am! 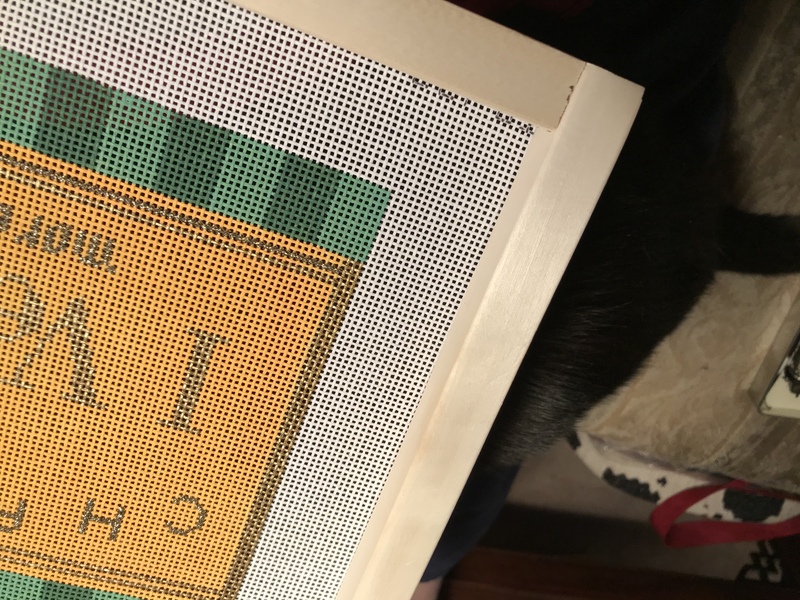 This is AlleyCat and I stitching the other night. She positions herself on my lap under the canvas and will sleep there for a few hours, or until I disturb her! I really try hard not to, as she will not be pleased and then she sasses me! It’s usually when I absolutely have to go to the bathroom is when I disturb her slumber! I’m working on a canvas by Thorn Alexander which is a new artist. It’s all about Veuve Clicquot, my favorite champagne! I’ve been stitching the smaller letters and next will be beading the larger letters. I will need to remember to take a picture of the entire canvas for you. So you ask why I am stitching in “the ditch” or in “the well?” It’s not my first choice mounting the canvas that way, but taking it with Susan Portra, that is her preference. Her reasoning is #1 with the bars on top, it keeps your hands off your work and #2 when you turn your canvas over to end your threads, it keeps the stitches from being rubbed against the table! Plus I will be doing a fair amount of beading coming up and I do like the bars that way when beading! Getting caught up at the shop! Yeah! I need to get more thread orders placed which will be my focus the next few days. I liken it to painting the San Francisco bridge, as when you’re ordered all the thread lines, it’s time to start all over! Its 7 days and counting to first pitch… can’t wait! Ooooh, will you drink your favorite champagne while you’re stitching it? Haha! Love that AlleyCat doesn’t disturb your stitching. My cat sits on my table top frame holder while I stitch, and for the most part, she’s good about not playing with the threads. She does love to bat around my pens though. Oh no! No drinking while I’m stitching! Vicky, if you haven’t read The Widow Cliquot by Tilar J. Mazzeo, you might enjoy it, especially with a glass of bubbly at your side! It’s a nicely written biography of Barbe-Nicole Cliquot that incorporates the historical time frame (post French Revolution), the brass tacks of the wine business, and the unusual-for-that-time role of a woman running a business enterprise. Yes I’ve read that book and it was great read!